"Look out for the chalk men." I've seen The Chalk Man featured on several "most anticipated" lists, and every blogger who has reviewed the novel has been enthusiastic in their praise of it. When the publisher provided me a copy of the novel to read and review, I was eager to see what all of the hype was about. I wasn't prepared for the story that I was about to read. I wasn't prepared for the sleepless nights and unproductive days I would spend glued to the pages of the novel. This will, no doubt, be one of the must read thrillers of the year. Just know, you'll have no power in putting it down until you finish. Consider yourself warned. In 1986, twelve-year-old Eddie and his gang of friends are at the local fair. The waltzer ride malfunctions, sending a car with two girls flying into the pathway. Eddie is one of the first people on the scene along with an odd looking man dressed in all black with white skin and extremely light hair. At the time, both males are hailed as heroes. The man, it turns out, has just moved to town to be a teacher at the school. As time progresses, Eddie and his friends develop a secret code to communicate with each other. They leave little stick figures drawn in chalk for the others to find. The codes start innocent enough, but the kids could never have imagined what would happen if their secret messages could be used by someone else...someone with intentions that are purely evil. The year is 2016, and Eddie finds himself living in the same house and same town that he grew up in. He watched as his father battled and ultimately succumbed to Alzheimer's. His mother, finally free from the burden of caring for her ill husband, remarried and began traveling. Eddie stayed behind. One day, he receives a letter containing a stick figure drawn in chalk, a haunting relic from his childhood. Eddie thought the tragedies associated with the chalk figures were long behind him. When he learns that each of his former friends received similar letters, he knows those days are back. He must face the realities of secrets he tried to bury years ago. The Chalk Man is a novel that instantly drew me in and kept be enthralled until the very last page. C.J. Tudor writes chapters that alternate between past and present. I'm not normally a fan of this narrative device, but Tudor uses it to maximum effect here. The juxtaposition between the child and adult versions of the characters brings a greater depth to them, allowing the reader to experience their growth over a longer period of time. Switching between time periods also allows Tudor to end each chapter on a mini-cliffhanger. She deftly pulls the reader deeper and deeper into her eerie story, winding the tension and expectation a bit tighter with each page. Beyond the thriller beats, Tudor weaves in larger themes of love, friendship, and a tense debate of science vs. religion. The Chalk Man concludes with revelations that are sensational, tragic, and completely satisfying to the marvelous story that precedes it. 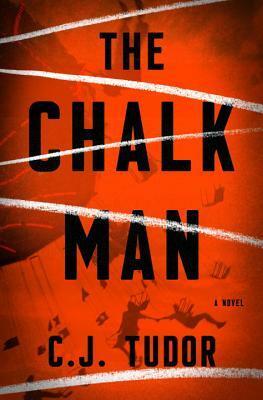 We may only be two weeks in, but The Chalk Man may be one of the best thrillers of the year! This entry was posted on Tuesday, January 9, 2018 and is filed under Book Review,C.J. Tudor,Mystery,The Chalk Man,Thriller. You can follow any responses to this entry through the RSS 2.0. You can leave a response. Oh, I really want to read this one! I was supposed to get a copy through First To Read but the download didn't work. May have to just order it, have heard so many great reviews. This one is definitely worth a read if you can get your hands on a copy! What an awesome way to start the reading year! It's the best encouragement to have an awesome read right away. PST - I'm on vacation and finally reading The Marsh King! So - I guess I'll ad this one to my list too. Enjoy your vacation! I can’t wait to read your review of The Marsh King!